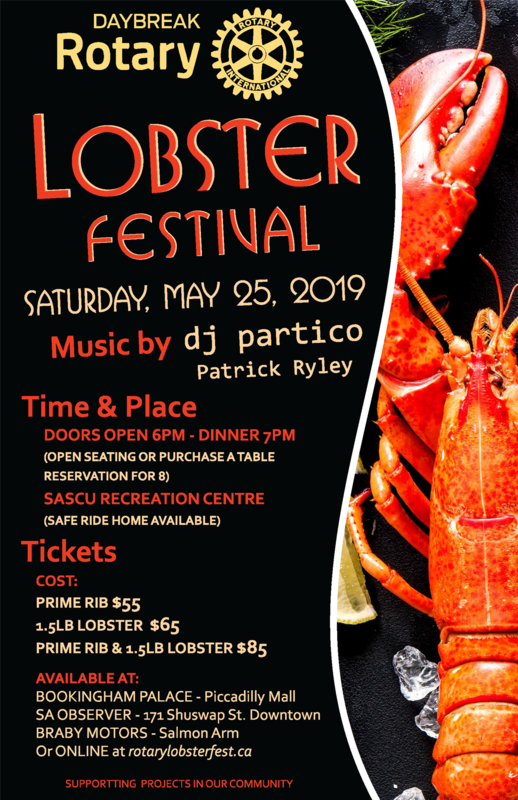 Tickets are available at Bookingham Palace, Salmon Arm Observer, Braby Motors, or right here online! NOTE: Your payment will be processed using Paypal - you do not need a Paypal account to make payment this way. Simply select how many tickets you'd like, and enter your credit card information. NOTE: disable your pop-up blocker! If you would like different ticket types, there will be a link in the shopping cart to continue shopping - click this and add all of your items. When done, checkout and submit payment. Please print and present your payment receipt at the event where we will hold your ticket for you to pick up at the reception desk at the event. All proceeds will go to the continued support of all the good works of Rotary in your community and beyond.